Despite forecasts of showers, we were lucky to play in pleasant weather with reasonable temperatures, and some nice sunshine for the back nine. The greens on the Old course were generously sedate, and the fairways in excellent condition. Basically no excuse for scores not to be excellent…. however! Thanks to JP being on his travels, I found myself as the event organiser, although ably supported by Duncan as Treasurer and Tony Michell organising the prizes. This clearly led to brain overload as I took a treble on the 3rd hole and a quadruple on the 4th. On returning to the club house to start recording the various scores, it appeared that I had got off lightly. On the front nine there were two 10’s (stableford total) and one 6! You know who you were! On the back nine a 10 and a 9. Sadly the 9 belonged to the player who scored 10 on the front nine and so Mr Clinch walked away with a delightful watch to add to his growing collection. Most improved player of the day award goes to Andre who managed 11 more points on the back nine. Clearly another golfer who does not like early starts. 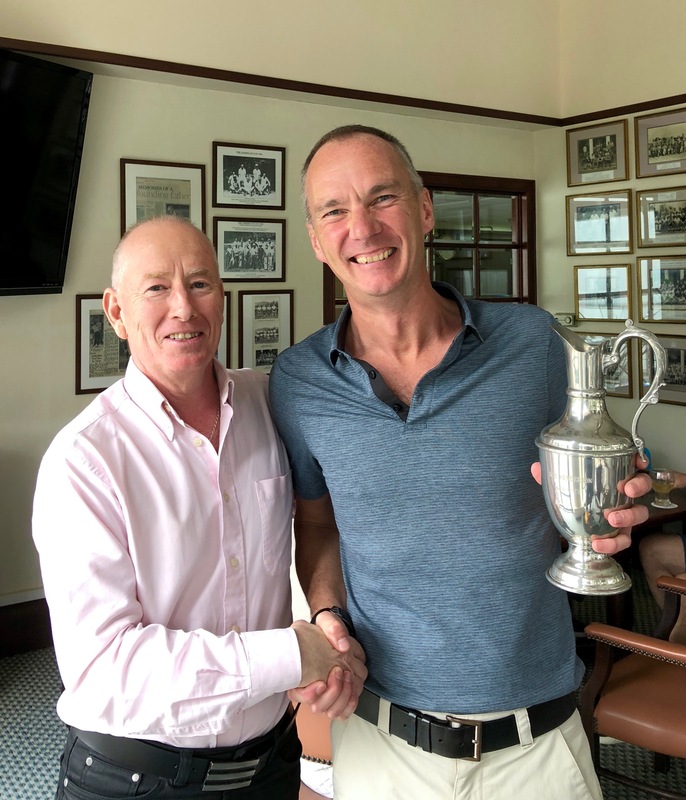 We were also joined by the legend Marty “Motormouth” Van Den Berg who clearly did not let his clubs do the talking, shooting 25 stableford with an underwhelming 92. This may have been as he realised that he was guaranteed the best guest award which he duly received. Vance Lee was helping me with the scoring and having scored a tidy 18+18 points was leader in the clubhouse until the last two groups came in and broke his heart. Messrs Zimmermann and Farmer both recorded 37 points, both shooting 21+16 so tied even on a 9 hole count back. Sadly Lorenz rather broke down at the end of his round and only scored 8 on the last 6 and so Nigel squeaked home as the 2018 Rob Henderson Trophy winner. Congratulations. Talking of heartbreak, my hope for the best back 9 with 20 points was dashed by Rob himself who after tying back 6 and back 3 pipped me with a net par on the 18th hole. We also managed to settle a couple of matchplay fixtures, with Tiku playing off an improbable 2 handicap after winning the DB monthly medal losing to Terry Wright, and Craig Chapman using past Mr Keen himself, 6&5. Thanks to Justin Davies and the Fry group for ball sponsorship for the team event, and to YB of Uncle Russ and Golf Asia for prizes. Next event 24th May, the Jens Munk Trophy + Champions Cup on the Eden, Blue tees.